The infamous British weather tried its very best to confuse the public last weekend for the launch of National Fishing Month (NFM). Despite blistering heat, high velocity winds and even lashings of rain, NFM events kicked off in style, bringing instant joy and lasting memories to the many people who took part. At a showcase NFM event at The Game Fair at Ragley Hall, near Evesham, coaching teams from The Professional Anglers Association and the Game Angling Instructors Association battled the wild weather conditions to give free coaching sessions to hundreds of youngsters and adults alike, often with whole families having a go, to cast a fly line or catch a fish on the lake. Some fabulous fish were caught, and there were wide smiles on the faces of the happy participants. Everyone who took part in a coaching session went home with a NFM ‘goody bag’ containing the ‘Get Into Fishing’ booklet full of information on how to get started and advice on different types of fishing, a log book to make a note of their first catches and a special certificate as a memento of their days free fishing. There are still hundreds of free events available to attend nationwide, listed online at www.nationalfishingmonth.com so there’ll be a participating venue close to everyone. Taking part is simplicity itself – just need to register online and then turn up. Everything will be provided without charge, and most people will experience the ultimate thrill of catching their first fish under the watchful guidance of their coach. National Fishing Month 2018 runs between 27th July and 2nd September. New appointments are being appointed to the National Angling & Fisheries Advisory Group (NAAG). The group is responsible for advising on the Canal and River Trust activities, as they work on improving fishery conditions along the 2,000 miles of waterways it cares for. David will remain as a group member. Ian Trayer: A lifelong angler who these days focuses on catching specimen fish both at home and abroad. Ian is a retired professor of biochemistry with a specific interest in water quality and molecular biology. He remains active at club level with Barnt Green Fisheries who manage the fishing at the Trust-owned Bittell Reservoir complex. Kye Jerrom: An Environment Agency fisheries technical specialist in the Anglian region, Kye has a wealth of knowledge of technical fisheries issues. A former level 2 angling coach, he remains an active match angling participant representing the Browning Hotrods team in the nation’s most prestigious angling events. Andy Strickland: A former chartered accountant, Andy is secretary of the Prince Albert Angling Society, the UK’s largest fishing club. As well as having fisheries interests on various Trust canals and reservoirs, Andy manages a portfolio of over 200 fisheries from South Wales north to the Scottish borders. Through Andy, the society have carried out significant volunteering work on their fisheries. The roles are three year terms. The NAAG meets three times a year and in the coming 12 months the group will be looking at how to encourage a new generation of anglers through its Go Fish campaign. The project examines the issue of non-native invasive species on the waterways, and improves the environmental appraisal process to better serve both fisheries and angling clubs. as they work on improving fishery conditions along the 2,000 miles of waterways it cares for. David will remains as a group member. The roles are three-year terms. The NAAG meets three times a year and in the coming 12 months the group will be looking at how to encourage a new generation of anglers through its Go Fish campaign. The project examines the issue of non-native invasive species on the waterways, and improves the environmental appraisal process to better serve both fisheries and angling clubs. Professional Anglers Association (PAA) coaches Tony Forman and Dave Brown, together with directors Roger Smith and Paul Forman, worked tirelessly over the weekend of The Big One Show to raise £683.86 for charitable purposes. The tackle raffle they ran was in aid of the Angling Participation Fund, which finances worthy angling causes throughout the UK. During the two days the coaches were in the hot, tented venue they had a hectic time keeping on top of the raffle, making up a never-ending stream of prize bags and dealing with general coaching and fishing enquiries. The Angling Participation Fund is a not-for-profit company that has been created by members of the ATA to encourage and secure contributions from both the trade and outside revenue sources in order to provide financial support to angling projects and initiatives across the UK. The company is currently going through the process of becoming a registered charity, and it is hoped that this will be achieved shortly. The Professional Anglers Association (PAA) is a major support organisation for a nationwide network of fully qualified, accredited and licensed angling coaches, who themselves recruit and teach thousands of new and budding anglers each year. If you are a fisherman and would like to know more about becoming an angling coach, please visit the PAA website www.paauk.co.uk or the Angling Trust website www.anglingtrust.net, or email info@paauk.co.uk for more information. Did you know that just about anybody can learn to fish? Fishing really is a four-season leisure pastime, and one of its joys is that in each season there are different and exciting fish to catch. Fishing transports you to the heart of nature and the many, intriguing plants and animals that live there. By attending an organised event this summer during the National Fishing Month Silver Jubilee, you could experience the joys of fishing yourself. Angling takes you into the fresh, unpolluted air, promoting healthy lung function and a sense of well-being. Recent research clearly shows that getting out on the bank can be good for you and the family. These health benefits also extend to the mind, and angling is well-known for its therapeutic, mental effects. It really is a perfect hobby to get you away from the daily stresses faced by both time-poor adults and children growing up in the twenty first century. Dean continued: “When I was a kid, I found it hard to get my head around school work or any kind of discipline. If it wasn’t for fishing and athletics I dread to think where I would be right now. Between them, they gave me something to focus on and kept me off the streets. It doesn’t matter what age you start. Children can take part on equal terms with their grandparents. You can fish alone, with friends or in an organised group for an hour or two or for a whole day – you have the freedom to choose. 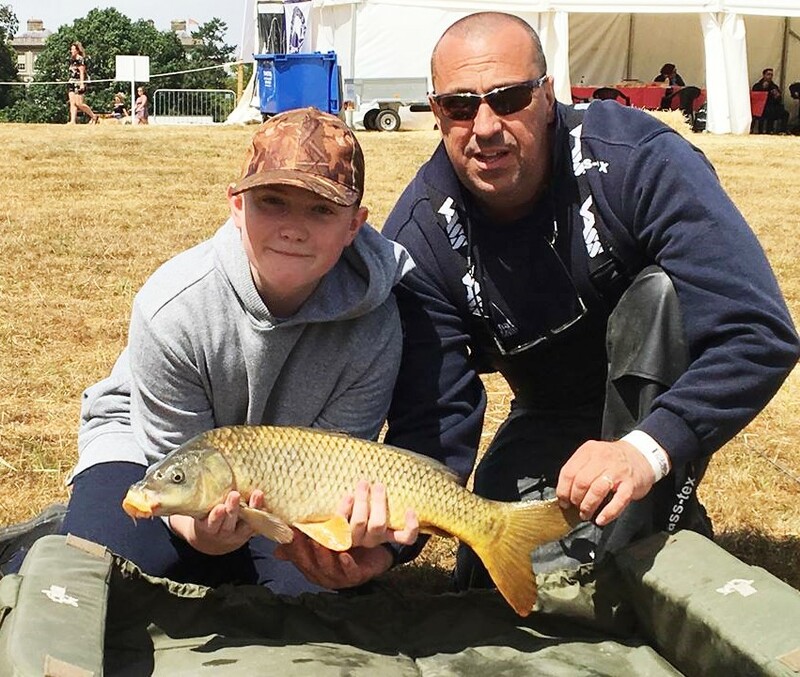 Enjoy yourself this summer, get outdoors and get healthy – take part in a National Fishing Month registered event and follow thousands of young people, parents, grandparents and friends who enjoy quality family time together at the waterside over the holiday period. Book your place now at www.nationalfishingmonth.com. For 25 years now, National Fishing Month has helped introduce nearly 300,000 people into the incredible sport of angling. It’s a hugely satisfying way to strengthen relationships and get active together, and it often leads to lasting participation in and a passion for angling. National Fishing Month 2017 runs between 21st July and 3rd September. 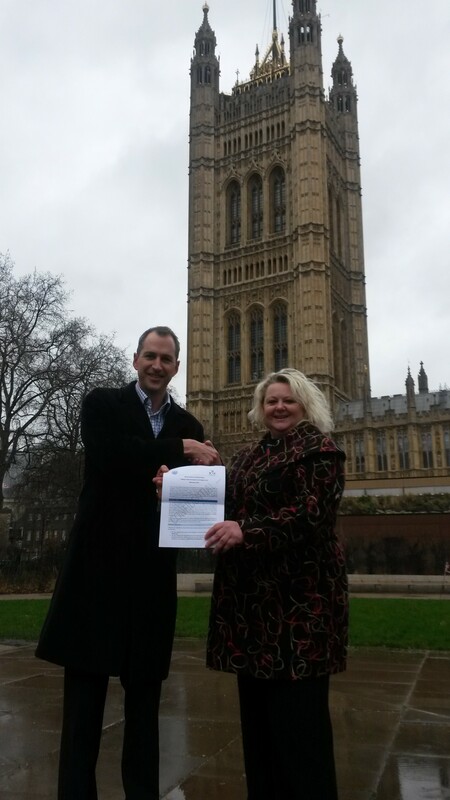 The Angling Trades Association has welcomed the recent, successful House of Commons Debate on Bass, secured by Scott Mann (Conservative MP for North Cornwall and a sea angler). The motion stated: ‘that this House believes that the recent EU restrictions on recreational sea bass fishing are unfair and fail to address the real threat to the future viability of UK sea bass stocks; and calls on the Government to make representations within the Council of the EU on the reconsideration of the imposition of those restrictions’. Now put your hand on your heart and ask yourself – did you really do your best as members of the angling trade, and as individual anglers, to add your voice and support the debate? Historically, the factual value of recreational sea angling to the trade and the economy speak for themselves. The Drew Report into sea angling in 2003 stated that £538 million pounds was spent annually by 1.1 million sea anglers. The CEFAS report for Defra titled ‘Sea Angling 2012’ revealed that there were 884,000 recreational sea anglers in England, directly spending £1.23 billion per annum (£2.1 billion including induced and indirect impacts). After deductions for tax and imports, the direct annual expenditure was calculated to be £831 million. The VAT receipts received by the Treasury were £166 million p.a. and bass angling was calculated to be worth £200 million each year in England alone. In 2015 the Blue Marine Foundation published a report ‘Defining the Economic & Environmental Values of Sea Bass’, focussing on Sussex. It revealed that sea anglers fishing in the county spent £31.3 million on tackle, charter boats and hotels, creating 353 full-time jobs whilst retaining just 15 tonnes of bass. In the latest ‘Tackle Trade Survey 2015’ published by the Angling Trades Association, which reported on research into the value of the UK sales of tackle and associated equipment (rods, reels, line, bait, lures, clothing and accessories), sea angling accounted for 10.63% of sales (£60.7 million of the total annual sales figure of £570.4 million). ‘We aren’t shouting loudly enough, either as businesses working within the sector or as individual anglers. We don’t need to get embroiled in a fight with the commercial fisherman – our immense value in numbers speaks out for itself. But what we do need to do is add our voices to the messages that the Angling Trust (AT), BASS and the European Anglers Alliance (EAA) are trying to get across. 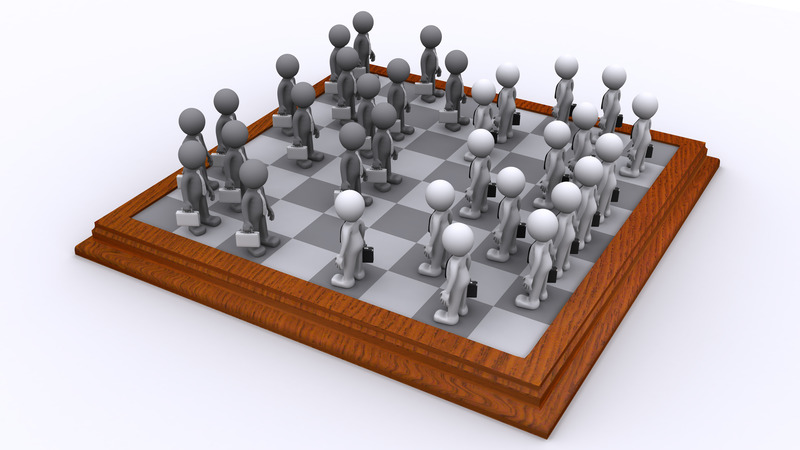 ‘It doesn’t matter what your personal opinion is of these organisations or their teams of people. The fact remains that the Angling Trust is the recognised National Governing Body for anglers in England and the EAA is the recognised body for anglers in Europe, and they are the organisations that are being invited to sit in front of the right people in Parliament (both in the UK and the EU) to put across our opinions. The ATA is urging all sea anglers, businesses involved in sea angling and sympathetic individuals to support the Angling Trust’s campaign by emailing the EU Commissioner, Karmenu Vella, with a short message of support. The email address is karmenu.vella@ec.europa.eu. Please also copy David Mitchell of the Angling Trust on your email: david.mitchell@anglingtrust.net. It won’t take long to write a message, but it could save your hobby, your job or your business! Angling Direct has joined the 5p bag scheme… but with a big difference. In conjunction with the Angling Trades Association (ATA) – of which the company is a member – ALL proceeds generated from sales of Angling Direct carrier bags will go directly towards supporting National Fishing Month (NFM). The scheme also aims to reduce the discarding of single-use plastic carrier bags within the angling trade, and the litter associated with them, by encouraging people to re-use their bags when they go shopping. 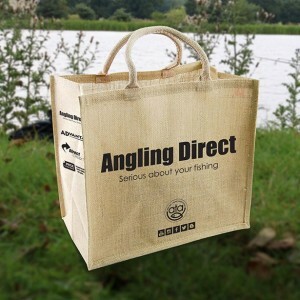 Angling Direct will soon be introducing their own version of the hessian ‘Bag for Life.’ Again all money raised will go towards National Fishing Month. Exciting developments following on from a number of discussions have resulted in the recent announcement that the Angling Trades Association (ATA) and the Angling Trust (AT) have signed a Memorandum of Understanding (MoU). The strategic aim of this collaboration is to secure a sustainable future for angling by recruiting and retaining more anglers, campaigning to protect and improve fish stocks and the rights of anglers to fish for them and thereby generating more customers for the trade. Angling and the industries it supports face huge challenges. The average age of anglers is increasing, rod licence sales are declining and the recent Active People Survey showed a dramatic drop in weekly participation. Many companies involved in servicing the angling industry are facing reduced revenues as a consequence. At a time such as this, it is vital for national angling bodies to make the best use of resources to address these challenges and breathe new life into angling. The pragmatic way to achieve this is for organisations in the sector to work collaboratively and to investigate new ways of benefitting from economies of scale and clarity of structures. The ‘Fishing for Life’ National Angling Strategy was published by the Angling Trust in November 2012 with the support of the Environment Agency and informed by the national surveys undertaken by the research company Substance. The strategy was also partly underpinned by the ‘Fishing for Answers’ report, published by Substance in January 2012, to which the Angling Trades Association and the Angling Trust were significant contributors. The new MoU both embraces the sentiments of this strategy and uses the detail to frame the actions to be undertaken. Although winter is upon us and people have started their Christmas countdown, the Angling Trades Association (ATA) is looking ahead at the calendar of events for next spring and summer. The Association plans to maximise opportunities for its members to promote their businesses and invigorate its key participation events, such as National Fishing Month. Following the demise of the original CLA Game Fair, announced earlier in September, there has been a plethora of rumours, announcements and cancellations regarding potential new shows. Some are aimed firmly at the general public and urban dwellers with rural aspirations; others are slanted towards those interested in the traditional countryside activities. The UK Game Fair will take place on 22nd-24th July 2016. ATA Chair Naidre Werner, who recently met organisers Blaze Publishing, believes that the Fair stands out from the crowd, saying: “It made a refreshing change to talk to the owner of a show who had the commercial interests of the exhibitor at the forefront of his mind. “There is a determination to create a showcase event that accurately and positively represents and promotes fishing, shooting and hunting. The organising team impressed me with their eagerness to heavily promote the fishing focus of the show and their determination to invest time and money into creating a true enthusiasts’ experience. The venue for the new show – the NAEC at Stoneleigh Park, Warwickshire – will be familiar to many people. Located in the triangle between Coventry, Leamington Spa and Kenilworth, Stoneleigh has strong historical links to the rural economy, and for many years it hosted the now defunct Royal Show. It boasts two lakes on site, perfect venues to introduce coarse fishing to youngsters who have little or no experience and current coarse anglers who would like to upskill and learn a few new tricks. The site encompasses a picturesque section of the River Avon which provides great opportunities for fly casting tutorials, demonstrations and master classes. UK Game Fair organiser Wes Stanton added: “The important thing with a country pursuits event is to make sure that it has a core content that will be of interest to visitors. A solid fishing and retail experience has to be part of that show. “I think that we see too many outdoor shows where the first thing that greets you when you walk through the gates is a face painting stall or a merry go round, and you walk around to find stands selling revolutionary pan cleaners, home-made sweeties and wind chimes. For more about the UK Game Fair call 01926 339808, follow on Facebook UKGameFair or Twitter @UKGameFair. A small, but unexplained number, of carp have died over the past few weeks raising concerns over a viral outbreak at Moor Monkton Pools situated on the outskirts of York. After the confirmed case of Koi Herpes Virus at Leeds & District’s ASA’s Kippax polo pond, the society this week suffered more bad news at their recently purchased venue near York. On-site fishery manager and Leeds president Stan Jeffreys said this week that the deaths had been reported to the Environment Agency which is arranging for samples to be collected and sent to laboratories for testing. At the moment, Mr Jeffreys (together with EA officers) does not think it is the Koi Herpes Virus and is swaying towards a dietary problem.